The easy open lid of a food can is an example of a direct social interaction between a person and an object. No extra tool, besides the can opener, is needed to open the can. The design of the can’s lid allows the person to be the function of a can opener. I perceive this intimate interaction also as a form of manual labor. My description is of this simple act of an idea that this convenient object needs manual labor to perform the activity of opening a can with the easy open lid. The significance of this description is to consider the cultural ideals of the idea of convenience and work and the beginnings of forming a collection of these social interactions of work between a person and object. The left hand is securely grasping the main body of the can. The tin can’s cylinder shape makes it is easy to grasp. The right hand reaching for the tab blocks the long thin rays of light that bounce across the shiny surface of the lid. 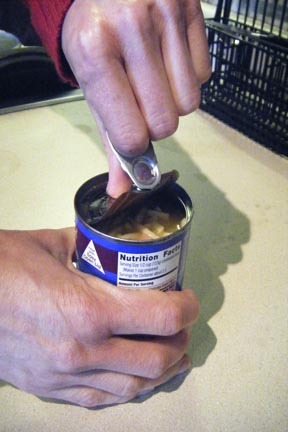 With a starting position of the pointer finger on the tab and the thumb on the outer edge of the can the pointer finger’s nail begins to lift the tab from the surface. The pressure from the hand to the fingernail along with the hard metal surface pulls the nail slightly from the finger. This slightly induced physical pain causes a reaction to slip the end of the finger under the tab. The pointer finger pulls the tab to the vertical position away from the lid of the can. This new position of the tab breaks the seal of the easy open lid. A suction noise occurs when the seal is broken and the center of the can swells and rises with the air entering the can. The pungent smell of condense soup is pushed out of the can with the entering outside air. With the tab bent up vertically a very small section of the lid is bent inward. This exposes the sharp edge of the lip of the can. The hand repositions with the pointer finger in the opposite direction and the thumb in the center of the can. Now all the pressure is on the thumb while the pointer finger is lifting the lid from the can. The tendons tighten across the back of the hand as the motion is carried through. The sound of metal releasing from metal does not last long in the quickness of the motion. The condense soup odor becomes stronger as the opening is enlarged. The thumb’s position moves from the outer edge of the can to move upwards with the pointer finger. The thumb contributes to the grasp on the tab during the final separation of the easy open lid. The hand carefully twists back and forth with a final sound of the metal edges scrapping together to confirm the lids removal.